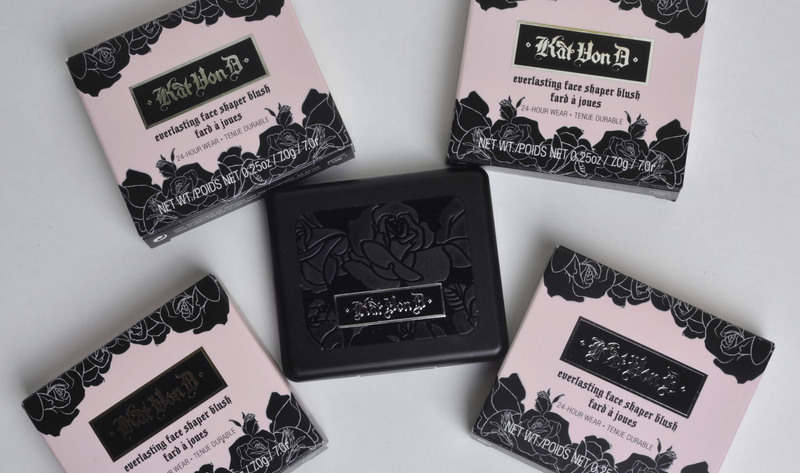 I heard about Kat von D a long time ago but I just recently tried it, I was specially tempted by the new everlasting blushes. With that purpose in mind I got Essex, Truth, Bellisima and Por Vida. I only have one eyeshadow palette (Saint), I am not that impressed with the texture, I have the feeling they are much more appropriate for younger eyelids. The blush case is plastic and the eyeshadow case metal, in the blush you get 7g of product for 25$. When I first swatched these blushes I was impressed, nice texture, nice pigmentation and wearable shades, it sounded really promising. I know I am very picky, sorry, but my skin needs a lot of help, not only color but something extra that’s a bit difficult to define, but something will add some youth and life to my ageing skin. 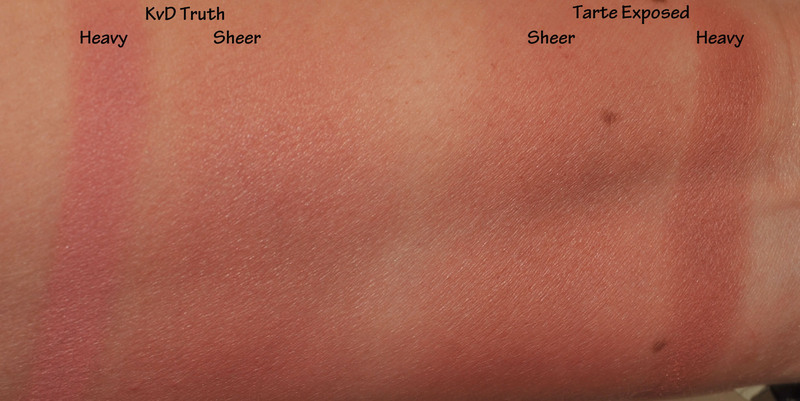 I have tried to compare them with the Tarte blushes, just to understand why they don’t look that amazing on my skin. I love all of them, some are more glittery than others but they all look great on my skin. I prefer to apply them with a goat hair brush, the more you blend them, the better they look. They cost 26$ for 5.6 g. Their finish is more velvety, I can build them up and they won’t look heavy or powdery. 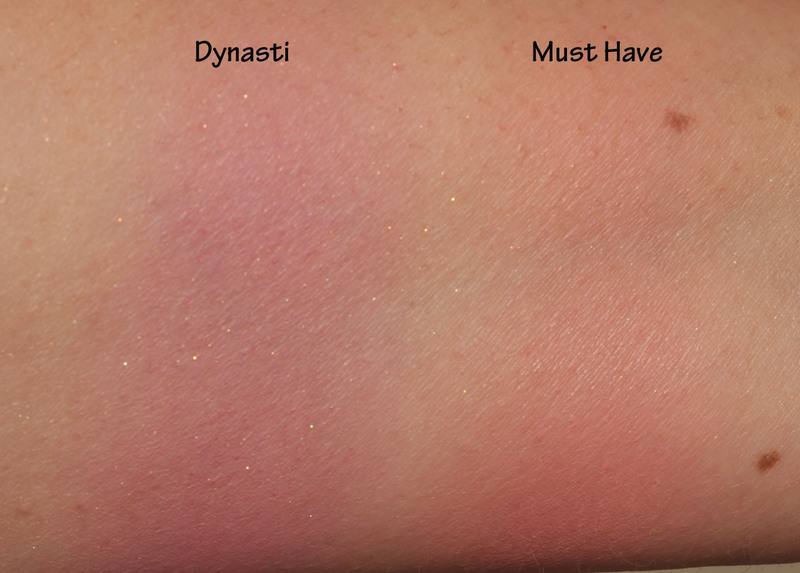 It’s not very visible on the swatches but when I compared KvD Essex to Tarte Exposed, although they look very similar and both lasted a very long time, Exposed felt more lightweight and natural and it doesn’t emphasize my fine lines as much as the Essex does. 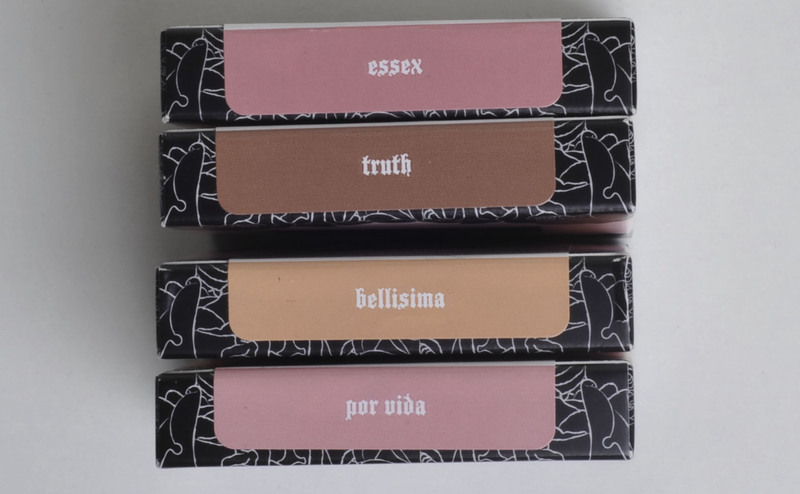 KvD Truth is more pink than Tarte Exposed but again, something is missing, Truth looks “ok” but not good enough for me see an enhancement of my complexion. 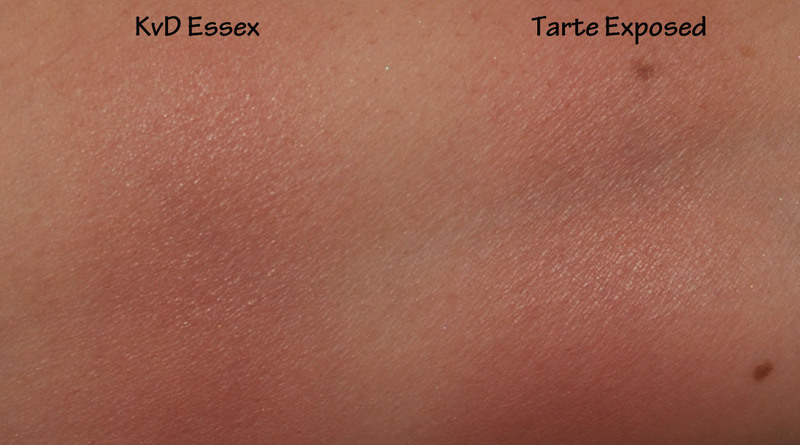 Tarte Exposed lasted a bit longer but both are extremely long lasting and will stay put all day (well, only office hours – 8 till 6). 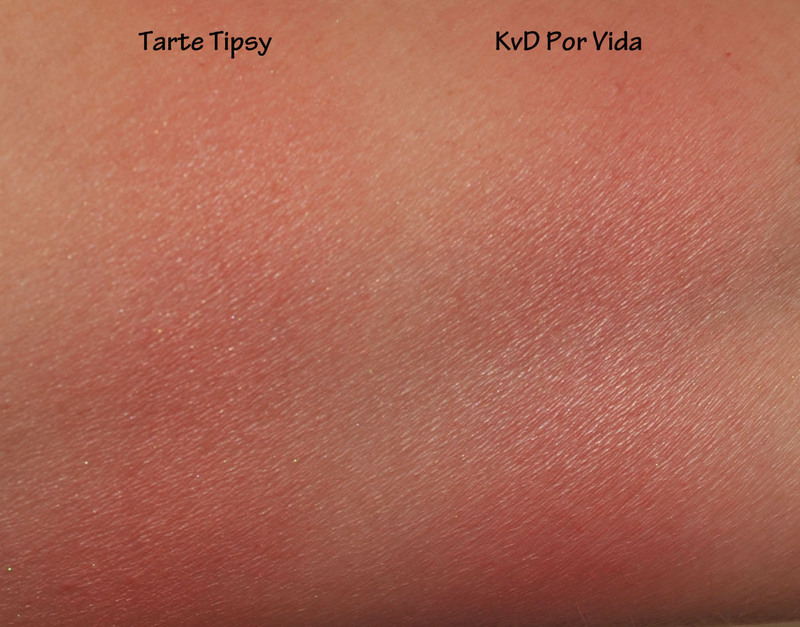 I tried also KvD Por Vida vs Tarte Tipsy, again the shine on Por Vida is not as flattering as the shine on Tipsy. Same problem, it emphasizes my fine lines a bit more. Bottom line : they somehow emphasize my fine lines, they also feel heavy on my skin, you can actually see the blush, not only a hue of color. I also don’t really like when the powder is so volatile, you’ll see what I mean when you pick the product with a brush, I prefer when the powder is a bit more compacted. I think that it’s a combination of texture and color that makes them not the best option on my 40+ skin. Since I had my Make Up Store blushes out, I’ll also share some swatches. They cost around 18$ for 2.5 g and the packaging is not great at all and impossible to depot, quite expensive blushes but they have a wide range of colors. Some are more long lasting than others, the less long lasting are Passion and Lust, the others are more intense and will last a few long hours. When I enter their shop, they have all these little tester pots open and I start swatching them like a wild woman 😀 my brain ends crashing with too much to process … but it’s great fun ! My favorite are the Tarte blushes, then the Make Up Store, I will keep on trying these Kat Von D but I would be curious to know if you tried them and if yes, what colors did you try and if you liked them. Kat Von D Everlasting Blushes was last modified: August 4th, 2013 by Sonia G.
😀 they don’t last as long as the Tarte… I wonder if there are any waterproof blushes that don’t look like masks … hmmmmm…. The Tarte ones i tried were not that “wow” for me. 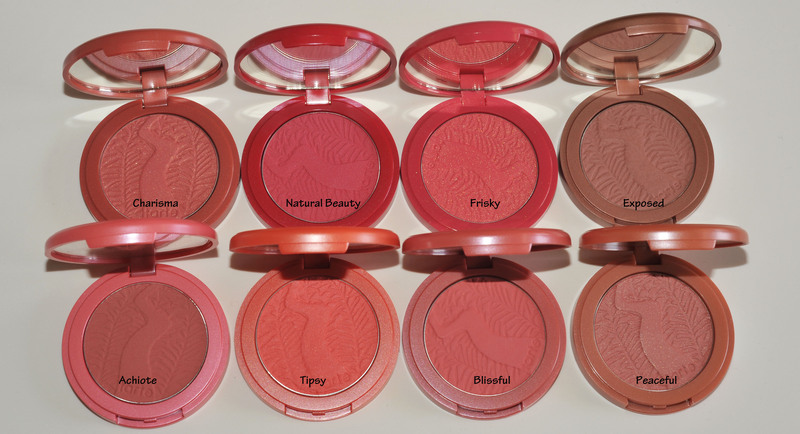 Sure the colors are great but for me the texture was not comparable to some other blushes i have with the same color. Evtl. when i can see them in person there is an other color i like but for me the way to get them was too complicated. Mmm those Makeup Store blushes look good. They just opened here andi am so curious! I am not a fan of their brushes, I find them too scratchy, but I own a few dark purple taupe eyeshadows (I totally recommend you to check them out!). You should ride with the kind of helmet that looks like an astronaut. It is the best protection for your safety and would block the wind from your makeup. I think it’s fantastic to have someone trying to get them in ! Thanks for the report, Sonia. As always, lucid and entertaining! Glad you enjoy it ! makes my day !!! Sonia, have you tried any Tom Ford blushers? You must have! I am having a major love affair with all his products at the moment – I have gone totally crazy for everything of his at the moment! I was at the shops yesterday, I went to the most luxurious one in Geneva to see if I could try Frederic Malle Portrait of a Lady (perfume), so they didn’t have it, I saw the TF lipsticks and started chatting with the SA, she told me that in fall they will carry ALL the TF cosmetics !!! youhouuuuuu !!! Silly question – of course you have tried them! Actually, most of the colours are too intense for me – I am super-pale at the moment, but I love the ones I have. The quads are amazing, and the lipsticks are everything a lipstick should be – not only are the quality, texture and pigmentation outstanding, but they just look so chic and luxurious. I keep one on my desk at work every day and can’t stop looking at it!